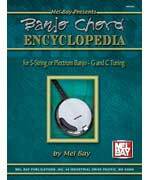 This book presents an extremely comprehensive collection of 5-string and plectrum banjo chord forms for G and C tunings. Beginning with C and proceeding chromatically through B, every possible inversion of every chord, from basic triads to thirteenth chords-are shown in easy to read diagrams. To aid in comprehension of chord construction, every chord is shown in root position in standard notation. A general review of hand positions, general technique, bridge adjustments, strings, and use of the capo is provided in the last few pages. Illustrated with pencil drawings, diagrams and photographs. This handy book shows all of the basic banjo chords in photo and diagram form. The front of the book contains a section of bluegrass G-tuning chords, and the remainder contains C-tuning. A quick-reference guide to bluegrass G-tuning banjo chords, plus a fingerboard diagram showing the location of the notes on the banjo fingerboard. The Banjo Chord Finder is an extensive reference guide to over 2,800 banjo chords, covering four of the most commonly used tunings. Thirty different chord qualities are covered for each key, and each chord quality is presented in two different voicings. Also includes a lesson on chord construction and a fingerboard chart.